Check Out a World Renown Sunset of Austin's Skyline! 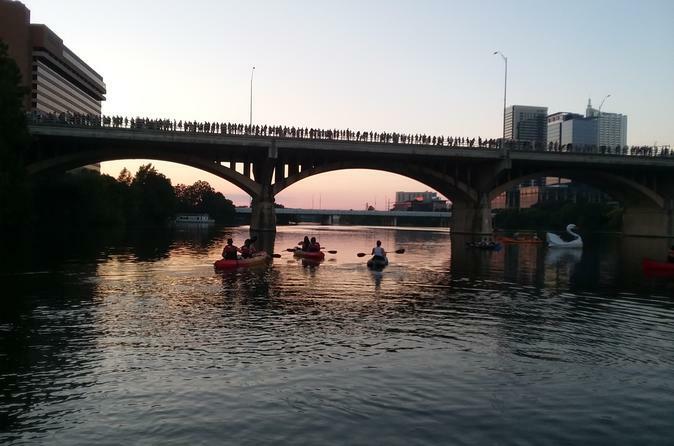 Lone Star Kayak Tours offer nightly guided kayak tours to watch amazing sunsets of the city and surrounding area. Come paddle with us and learn about this diverse urban eco system and the history of the beautiful city of Austin itself. This fully guided historic tour of will take you through the hear of the city as the sun goes down. Fewer boats on the river in the evenings helps make this one of our most serene and relaxing excursions. Suitable for all ages and ability levels. 20 min training session included before tour. Reservations recommended. The Sunset Skyline Kayak Tour is a great way to experience the water, nature, and a memorable bat moment. This is an experience you can only get in Austin. This tour is a total of two hours, beginning at 6pm and ending at approximately 8pm daily. Please arrive to departure point 30 minutes before scheduled departure. Customers will receive a full refund with 24 hour notice of cancellation. Customers will also receive a full refund in case of operator cancellation due to weather or other unforeseen circumstances. Contact us by phone to cancel or inquire about a cancellation. No-shows will be charged the full price.